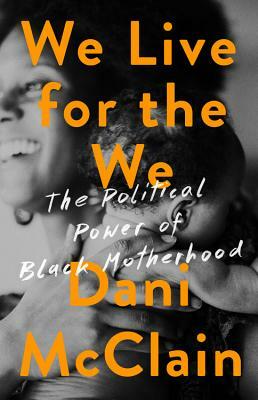 In We Live for the We, first-time mother Dani McClain sets out to understand how to raise her daughter in what she, as a black woman, knows to be an unjust--even hostile--society. Black women are more likely to die during pregnancy or birth than any other race; black mothers must stand before television cameras telling the world that their slain children were human beings. What, then, is the best way to keep fear at bay and raise a child so she lives with dignity and joy? McClain spoke with mothers on the frontlines of movements for social, political, and cultural change who are grappling with the same questions. Following a child's development from infancy to the teenage years, We Live for the We touches on everything from the importance of creativity to building a mutually supportive community to navigating one's relationship with power and authority. It is an essential handbook to help us imagine the society we build for the next generation. Dani McClain reports on race and reproductive health. She is a contributing writer at The Nation and a fellow with Type Media Center (formerly the Nation Institute). McClain's writing has appeared in outlets including Slate, Talking Points Memo, Colorlines, EBONY.com, and The Rumpus. She was a staff reporter at the Milwaukee Journal Sentinel, and has worked as a strategist with organizations including Color of Change and the Drug Policy Alliance. McClain lives with her family in Cincinnati. window into the granularity of the challenges millennials face when parenting.